Basecamp DPM Sleeping Bag. The Snugpak Sleeper Zero DPM Camo Sleeping Bag. 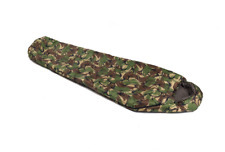 Snugpak Sleeper Zero DPM Camo Sleeping Bag. Sleeper Zero DPM Camo Military Army. Compression stuff sack included for compact carrying. Highlander Ranger Cadet 350 Camouflage Mummy Sleeping Bag. Mummy style for greater heat retention. Includes stuff sack (40x23x23cm). Sleeping Bags. Colour: Camouflage. Affordable and practical sleeping bag. 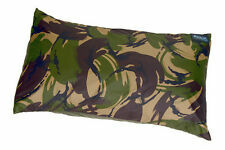 Aqua Products NEW DPM Camo Aquatexx Carp Fishing Pillow Case/Cover. A full sized pillow case in our popular DPM camo Aquatexx® Designed to fit standard sized pillows. The ideal baiting tool for smaller venues and wary carp, allowing boilies to be introduced quietly where excess disturbance can ruin chances of action. 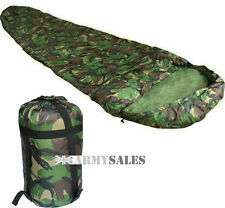 Military Syle 3 Season Sleeping Bag by Kombat UK in DPM Woodland Camo. Fortis Techlite Standard Dpm Snugpak Sleeping bag, only been used for 4 nights fishing. Comes with stuff sack and attached original product information tag card. Listing as Condition is Used but please bare in mind it is immaculate. Dispatched with Royal Mail 2nd Class signed for only. DPM BIVVY BAG and DPM SLEEPING BAG. Good condition. DPM Bivvy Bag and DPM Sleeping Bag. Good condition.. Condition is Used. Dispatched with Royal Mail 2nd class. Mil-Tec 1 Season Military Sleeping Bag in DPM Camo. The zip can also be fully opened and the bag used as a comforter or blanket instead. Upper Material: 100% Polyester. Insulation: 100% Polyester. Lining: 100% Cotton. MUMMY SLEEPING BAG STUFF SACK (not shown). HIGHLANDER CADET JUNIOR 350. For safety there is no draw cord around neck / hood on Junior sleeping bag. Material 350 gramspm. I will sort them out. Bottom of bag to neck not including hood is 125/130cms approx. Colour: British DPM Camouflage. Compression stuff sack included. Width (Chest): 80cm. Highlander Phantom 400 DPM Camo. Colour: DPM Camo. Shaped hood that substantially reduces heat lossCompression sack. Sleeping Bags. Filling: QXF3D Spiral Hollow fibre. Weight for weight the QXF3D fabric is lighter than ordinary solid fibre fillings. Moreover it retains its insulating abilities even when damp, does not require special care and may be even washed in the washing machine. The Phantom 250 is a high quality, durable sleeping bag, especially designed to ensure maximum thermal insulation and comfort. Handmade from start to finish in the UK, the Techlite sleeping bag boasts all the features of a traditional military bag but is manufactured with the tweaks needed to suit the overnight angler. The Techlite has elasticated hoods top and bottom, and a detachable bedchair strap around the middle. Highlander Cadet 350 Adult Sleeping Bag in Disruptive Pattern Material (DPM) Color. Mummy style for greater heat retention. Includes stuff sack (40x23x23cm). A highly practical sleeping bag for camping, cadets, or even to have in the house for the occasional guest! British DPM Camo. The Phantom 400 is a high quality, mummy style sleeping bag, specially designed to ensure maximum thermal insulation and comfort. It features QXF 3D spiral hollow fibre encased in a protective Apex Cocoon fabric, Polyamide Rip-Stop outer and breathable soft touch Polyester lining along with a well-shaped hood. DPM CAMOSLEEPING BAG. Complete with compression sack. 350gsm Hollow Fibre filling for lightweight warmth. Durable 170T Polyester outer shell. Foot box for added comfort. Open size 228 x 76 x 55 cm. Military Sleeping Bag – DPM. Side zip and drawstring hood with compression sack. Composition of: nylon shell, cotton lining and hollow fibre filling.